Are you an ecologist who loves science communication? Ayesha Tulloch and I are excited to invite you to submit an abstract for a special symposium at the upcoming EcoTAS 2017 conference in the Hunter Valley: “Communicating ecology to a broad audience: Novel ideas and approaches”. Symposium speakers will include early-career and established researchers from diverse fields spanning ecology, conservation biology, science communication, art, scenography and environmental policy. The symposium will consist of a group of invited talks followed by a set of 5-minute speed talks. The symposium will also help to launch a new ESA Research Chapter for Science Communication. If you are a creative soul with ideas about communicating your ecological research in new or inventive ways that engage audiences from outside academia, or if your science involves regular communication and engagement with non-academics (such as citizen science programs, policy briefings or school-based education activities), then this session is for you! We encourage poetry, art, music, comedy, interpretive dance, and other non-traditional forms of communication during your 5 minutes. Prospective participants for the symposium should prepare an abstract for their presentation that uses only the 1,000 most common words in the English language (the “Up-goer Five” challenge: see https://blogs.scientificamerican.com/guest-blog/science-in-ten-hundred-words-the-up-goer-five-challenge/). Otherwise, please follow the abstract-submission guidelines on the EcoTAS website. The closing date for abstract submissions is Friday 14 July, 2017. The Science Communication Research Chapter will be offering a prize for the best spoken presentation on science communication by a student at EcoTAS 2017 and at future ESA conferences. Symposium summary: Science communication is an important component of our work as ecologists. But how do we connect with the diversity of audiences outside academia in an engaging and effective way? And how do we communicate calmly and clearly when agitated and ill-informed voices are so prevalent in public discourse? This symposium will present novel ideas and approaches for communicating ecology to a range of groups including school children, educators, policy makers, land managers, industry and the general public. These include art-science workshops, science comedy, community-based engagement programs, citizen science, briefings/summaries (such as ESA’s Hot Topics), science books for children, costume, poetry and song. Earlier this year I published a book called Ecology of Urban Environments. It’s a text book for university students, but it contains lots of great stories about urban nature that I’d like to share with everyone! So I’m starting a new series of blog posts – Urban Ecology Stories. The spotted handfish – a fish that walks! The spotted handfish (Brachionichthys hirsutus) is a fabulous fish from the Derwent River estuary in Tasmania, Australia. It’s called a handfish because it ‘walks’ slowly along the seabed using its pectoral and pelvic fins, which look like human hands. The spotted handfish is listed as critically endangered by the Commonwealth of Australia and the International Union for the Conservation of Nature (IUCN). Why is the spotted handfish endangered? Populations of the spotted handfish have declined since the northern Pacific seastar (Asterias amurensis) was introduced to the Derwent River estuary in the 1980s. This seastar is a voracious predator! It eats the stalked sea squirts (ascidians) that the female handfish use as handy places to attach their egg masses, and it may even eat the eggs themselves. Poor water quality in the estuary is also a problem for the spotted handfish. What’s urban about this story? The two main threats to this species – an introduced predator and poor water quality – are both the result of urbanization; that is, the construction of the city of Hobart on the estuary that the fish calls home. We often think about the impacts of urbanization on terrestrial environments (land), but it also has many important impacts on marine and freshwater environments (oceans, estuaries, streams and lakes). Ships visiting from distant international ports bring non-native marine species on their hulls or in their ballast water. Rivers that flow through urban areas bring silt, rubbish, heavy metals, pesticides, nutrients and other pollutants into estuaries and out to sea. We can work together to address these problems in cities around the world. Barrett, N. (2013) Australian endangered species: Spotted Handfish. The Conversation July 4, 2013. Coughanowr, C. and Whitehead, J. (2013) The Derwent Estuary Program: A collaborative model for science-based management, Tasmania, Australia. Ocean & Coastal Management 86, 110–118. Parris, K.M. (2016) Ecology of Urban Environments (Wiley-Blackwell, Oxford), Chapter 3. At last – the final installment of this intriguing trilogy! The third reason that frogs and roads don’t mix is that the noise of road traffic (cars, trucks, motorcycles and other vehicles) can make it difficult for frogs to be heard by other frogs. Anyone who has listened to a group of frogs calling at a pond or stream can guess that acoustic communication (communication with sound) is very important for this group of animals. Male frogs call to attract females for mating, and also to stake a claim on a certain calling location. The advertisement call of a male frog says two things: 1) “Hey ladies, I’m over here”; and 2) “Back off chaps, this is my space”. Each species of frog has a unique call, so a female frog can recognise males of the correct species in the dark (although occasional mix-ups do occur). Road-traffic noise can reduce the distance over which a male frog’s call can be heard by females of the same species by up to 90%, with bigger frogs being the biggest losers. This is because bigger frogs have lower-pitched calls which overlap more with the pitch (frequency) of traffic noise than do the calls of smaller frogs. The loss of communication distance in noise is known as masking or acoustic interference. Traffic noise is more than a nuisance for urban frogs – it may be interrupting froggy loving on a grand scale. Road-traffic noise also hinders acoustic communication in birds and insects, while boat-traffic noise interferes with acoustic communication in fish, dolphins and whales. Traffic noise may also make some animals more vulnerable to predation (because they can’t hear their predators coming) and reduce foraging success by animals such as bats that rely on sound to detect their prey. It’s a noisy world out there, and it’s not just humans who are experiencing the effects! Some species of frogs are calling at a higher pitch in traffic noise, helping to reduce acoustic interference and get back some of the communication distance lost. 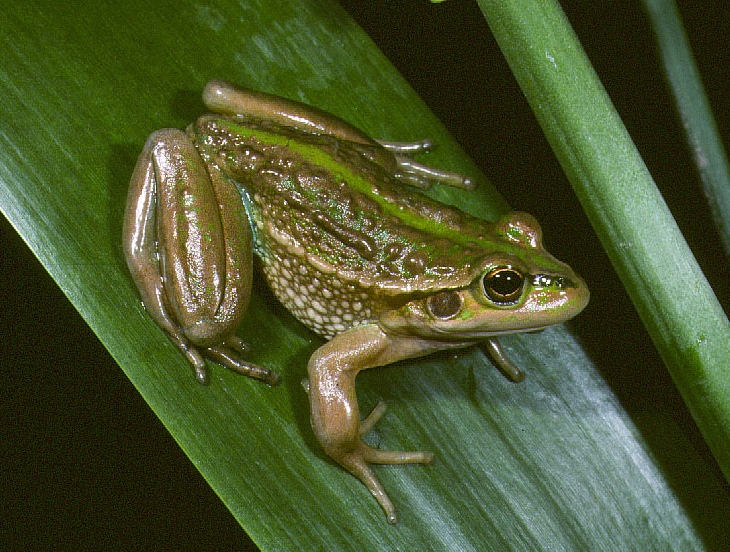 For example, the southern brown tree frog Litoria ewingii from Australia calls at a higher pitch at noisy urban sites than at quiet rural sites. But this is not enough to overcome the effect of traffic noise completely. In many places around the world, we use sound barriers and other structures to protect people from high levels of traffic noise – perhaps it’s time to consider protecting frogs, birds, bats and other animals from traffic noise too? Parris, K. M. (2015). Ecological impacts of road noise and options for mitigation. Pp. 151-158 in R. van der Ree, C. Grilo and D. Smith (eds), Ecology of Roads: A Practitioners’ Guide to Impacts and Mitigation (Wiley-Blackwell, Oxford). Parris, K. M. (2013). Anthropogenic noise constrains acoustic communication in urban-dwelling frogs. Proceedings of Meetings on Acoustics 19: 010055. In Part 1 of this series, I showed how difficult it was for frogs to cross busy roads without getting run over. The second reason that frogs and roads don’t mix flows on from the first one – if frogs can’t cross roads safely, then they can’t move safely between different areas of habitat that are separated by roads. This leads to something ecologists call habitat isolation. Habitat isolation – what’s so interesting about that? 1. A group of frogs (a population) living in an isolated area of habitat can be separated from other populations of the same species. This means that friends from elsewhere rarely – if ever – come to visit. Over time this can lead to a loss of genetic diversity in the population, and something called inbreeding depression. Basically, without new frogs arriving in the population, the frogs that remain become too closely related to each other. This can reduce their fitness, making them less likely to survive and reproduce. 2. If a population living in an isolated habitat dies out, no new animals can move in to start a new one. So we are left with suitable – but unoccupied – habitat. This is a common problem in urban environments for small animals that move along the ground (such as frogs, reptiles and mammals), because cities often contain small patches of habitat for wildlife that are separated by busy roads. 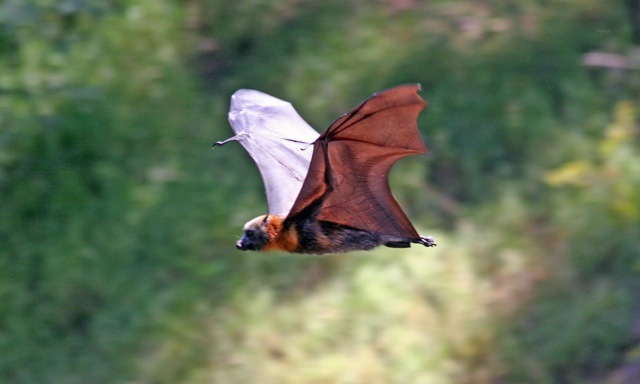 Animals that can fly (such as birds, bats and some insects) can cross busy roads more easily. 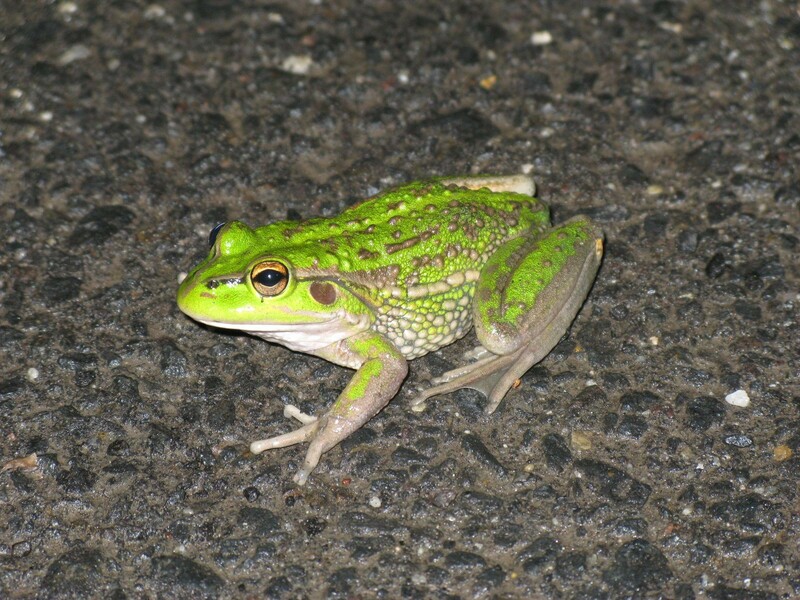 In a study of pond-breeding frogs in Melbourne, Australia (Parris 2006), I found that isolation by roads reduced the number of species of frogs that lived at a pond. Statistical modelling (a nifty method of analysing field data) predicted that the most-isolated pond (that is, the one surrounded by the most roads) would have only about 1/5 of the species as the least-isolated pond. 3. Some animals (such as the growling grass frog Litoria raniformis) need a network of populations in a network of habitat patches to survive in the long term – this is known as a metapopulation (Heard et al. 2013). Different patches in the network are occupied at different times. For example, some patches might be particularly good for frogs in times of drought, and others might be occupied only when conditions are very wet. If too many habitat patches in the network become isolated by roads, animals can’t move freely between them when they need to and the metapopulation doesn’t work properly. In some cases, metapopulations collapse and the all the populations within them die out. Keeping connections between habitat patches (such as habitat corridors) will allow frogs to keep moving between them when they need to do so. This is particularly important in places where new housing and industrial developments are being built – it’s much easier to keep existing connections in the landscape than to put them back later! Creating new habitat corridors and building road overpasses and underpasses may also help frogs and other animals move around urban landscapes, but these measures can be very expensive. Also, a recent study of some Australian frogs found that they weren’t very keen to use underpasses (Hamer et al. 2014). Where some habitat patches are going to become isolated from others in a network, it may be possible to create new wetlands to make up for the ones that the frogs will no longer be able to reach safely. Frogs are small animals that hop or walk along the ground. Roads are long stretches of gravel, concrete or bitumen that allow vehicles like cars, trucks and motorbikes to go from one place to another. These vehicles are often large and heavy, and travel very fast – much faster than frogs can hop or walk. This means that it is very difficult for a frog to cross a busy road safely, and many thousands of frogs (maybe even millions) are run over and killed on roads around the world every year. Why did the frog (try to) cross the road? So why do frogs try to cross roads? To get to the other side, of course! Frogs are busy animals and often have places to go. Frogs that breed in ponds may spend part of their time at a pond and part of their time in another kind of habitat. And at certain times of the year – such as the start and end of the breeding season – they need to move between the two. This type of movement is known as migration. Young frogs (juveniles) may also leave the pond where they were born and move to a new one. This type of movement is called dispersal. Roads are a problem for frogs because they can turn a regular journey into a very dangerous one. A number of years ago, researchers in Denmark measured how quickly amphibians (frogs and newts) moved when they crossed a road (Hels & Buchwald 2001). The fastest species in their study was the moor frog (Rana arvalis), which moved at 2 metres per minute. The slowest was the common newt (Triturus vulgaris), which moved at only 0.5 metres per minute. On Danish motorways, cars and other vehicles can travel at 130 kilometres per hour, which equals 2,167 metres per minute. That is more than 1,000 times faster than moor frogs can hop, and more than 4,000 times faster than common newts can walk! Tove Hels and Erik Buchwald used this information to work out the chance of a frog or newt getting safely across roads with different amounts of traffic. The news wasn’t very good. The moor frogs had about a 60% chance of safely crossing a road carrying 100 vehicles per hour (2,400 per day). This means that for every 100 frogs trying to cross the road, 60 would make it and 40 would be run over. The slower-moving newts only had about a 10% chance of crossing safely, meaning that 90 out of every 100 newts trying to cross a road with this much traffic would be run over. On busy roads with more than 15,000 vehicles per day, the speed of the different amphibians didn’t make much difference to their chance of a safe crossing – no matter how quickly they walked or hopped, they were almost certain to be run over. In Europe and North America, where lots of frogs tend to move at once, tunnels under roads have been quite useful in reducing road kill. Fences along each side of the road direct the frogs to the tunnels, where they cross underneath the road before going on their way. At this stage, we don’t know whether these kinds of tunnels work in other places such as Australia, where frog movements are more spread out over time. Some conservation groups (such as Froglife in the UK) help frogs and other amphibians to cross roads – this is known as patrolling. Otherwise, if you are driving at night – particularly if the weather is warm and wet – slow down and watch out for small animals crossing! The city of Melbourne, Australia is home to about 14 species of frogs, depending on where you draw the boundaries. And the boundaries of Melbourne are spreading outwards at a cracking pace, with new suburbs being built on its western, northern and south-eastern edges. Melbourne is already one of the most sprawling cities in the world, which means it covers a large area of land. At the moment, it measures about 60 km (37 miles) from east to west, and some suburbs are more than 40 km (25 miles) from the centre of the city. 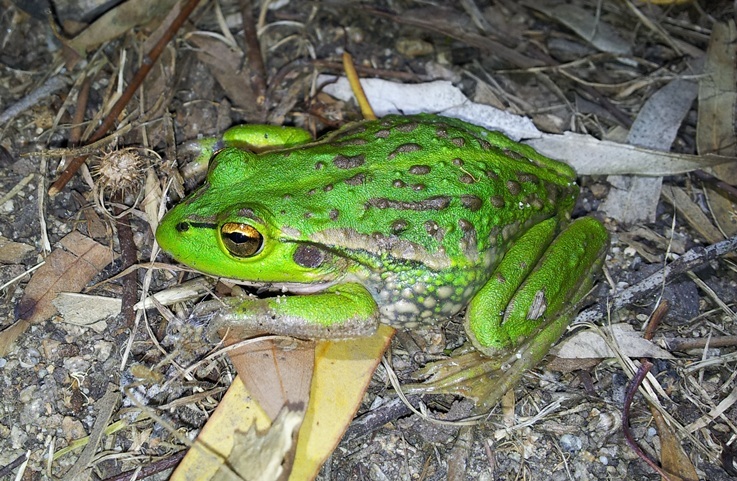 The growling grass frog is the only species of frog around Melbourne to be on the national list of threatened species. It is listed as Vulnerable to Extinction under the Environment Protection and Biodiversity Conservation Act 1999 (EPBC Act). Growling grass frogs used to be common across Victoria, but their geographic range (the area of land where they might be found) has been shrinking. Melbourne is an important place for this species, but there are fewer and fewer wetlands around the city where these frogs still live. 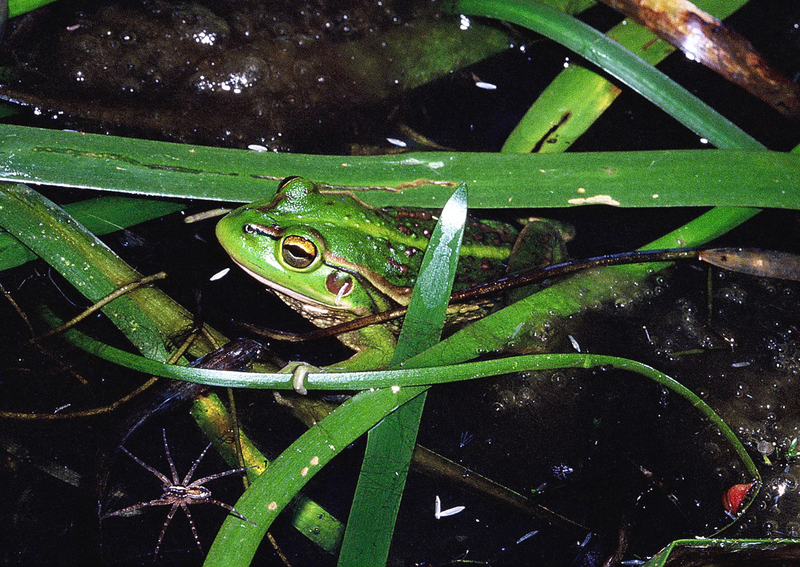 Research by Dr Geoff Heard and friends has found a big drop in the number of growling grass frog populations around the Merri Creek in northern Melbourne (a population is a group of animals or plants belonging to one species that live together in the same place). Growling grass frogs are big frogs, with adults growing up to 10 cm long. They come in many shades of green to brown, and the male frogs have a fabulous growly call. You can click here to learn more about them and to listen to some calls. 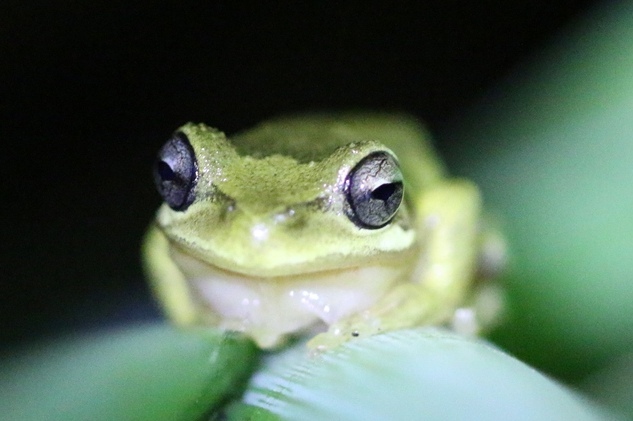 Claire Keely also has some great photos of growling grass frogs on her website. Claire is studying the population genetics of growling grass frogs in Melbourne for her PhD. The growth of Melbourne is a big problem for the growling grass frog, because new suburbs are being built right where it lives. But with some careful planning, frogs and people should be able to live together. If the new suburbs have areas of parkland next to creeks, and new wetlands are built to help replace some of those that are covered over by houses and roads, this will help growling grass frogs – and other wildlife – to survive. Parks and wetlands will also make the new suburbs nicer places for people to live. Property developers have complained about a draft plan to set aside areas of parkland along creeks (known as buffer zones) where houses cannot be built. Let’s hope that the Victorian government stands up for these beautiful and important animals in its updated plan to conserve animals and plants in the growth areas of Melbourne. This plan, called the Biodiversity Conservation Strategy, is due to be released soon. Why do flying-foxes like to live in cities? Flying-foxes are big bats – the biggest in the world! They belong to a group of mammals known as the Megachiroptera (pronounced “megga-kai-roptera”) or megabats. Unlike their smaller cousins (the Microchiroptera or microbats), they like to eat fruit, pollen and nectar rather than insects. Megabats are only found in the southern hemisphere, and they mostly live in tropical and subtropical parts of Africa, Asia and Oceania. So flying-foxes like their food vegetarian and their weather warm and humid. During the day, flying-foxes hang around together in big groups called camps – and I mean hang! They sleep hanging upside down in trees, but they also spend quite a bit of time chattering to each other and jostling their neighbours to get a better position when things are a bit crowded. Flying-foxes are very social animals! At night time, they fly out from the camp to look for food. This is known as foraging, and some flying-foxes can travel up to 50 km in one night to find a good dinner and then get home again. The biggest camps of Australia’s grey-headed flying-fox can hold 200,000 animals at a time. In the past, this species mainly camped in natural areas like sub-tropical rainforest, Eucalyptus forest and Melaleuca swamps. But recently, more grey-headed flying-foxes have been camping in cities, bringing them into closer contact with people. Old camps in Sydney and Melbourne have been getting larger, and new camps have appeared in cities such as Geelong, Bendigo and Adelaide. In 2003, a camp at the Royal Botanic Gardens Melbourne was moved to a new site on the Yarra River. More flying-foxes had been arriving at the camp every year, and people were concerned that they were damaging some important trees in the Gardens. The Royal Botanic Gardens Sydney is currently trying to move their flying-fox camp, for similar reasons (see ABC Radio National for an interesting story about the Sydney relocation). 1. There’s not much forest left. Huge areas of sub-tropical rainforest, Eucalyptus forest and coastal Melaleuca swamps have been cleared since the European settlement of Australia. One example is the Big Scrub, an area of sub-tropical rainforest in northern New South Wales that used to cover 75,000 hectares of land. More than 99% of this forest was cleared for farming during the 1800s, and now only about 100 hectares remains (perhaps it could be renamed the Very Small Scrub). These days, most clearing of forest and swamps along the east coast of Australia is for urban development such as new houses, roads and shopping centres. 2. City parks and gardens provide pleasant camp sites, and the city and suburbs can supply tasty food for flying-foxes, all year round. For example, there are more than 300,000 street trees in Melbourne that provide fruit and nectar for grey-headed flying-foxes to eat. 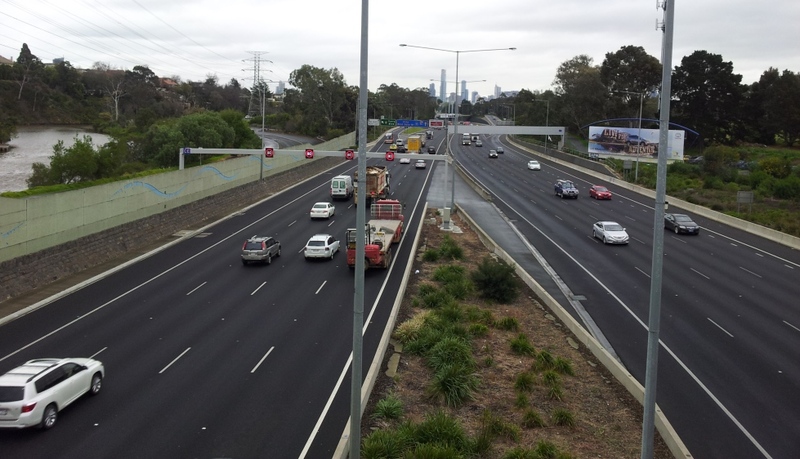 Many of these trees belong to species that do not naturally occur in Melbourne. 3. In southern Australia, cities are getting warmer. Due to something known as the urban heat-island effect, cities are often warmer than the surrounding countryside. And as cities grow, the effect gets larger. Temperatures in central Melbourne have been increasing since the 1950s, leading to warmer conditions (particularly at night) and fewer frosty mornings. Also, watering of city parks and gardens – to keep them green and lush during the warmer months of the year – acts like extra rainfall. So parts of Melbourne are now warm enough and wet enough for grey-headed flying-foxes to stay all year round. You’ve probably noticed that all these reasons have something to do with people. People have changed the environment for flying-foxes in Australia by clearing large areas of their natural habitat and making new habitats for them in cities. Is it surprising that they have decided to move in with us? Hall, L.S. and Richards, G. (2000). 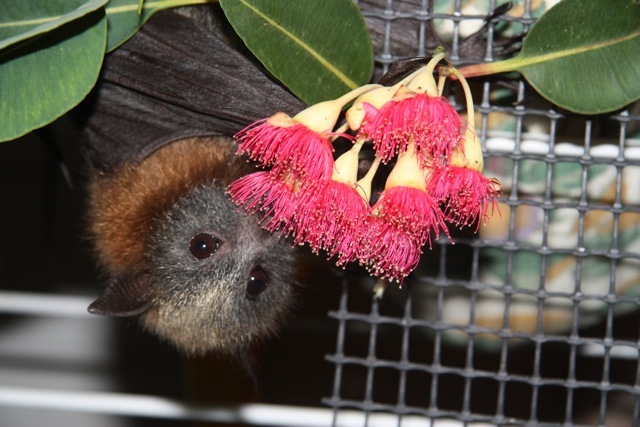 Flying Foxes: Fruit and Blossom Bats of Australia. University of New South Wales Press, Sydney. Parris, K.M. and Hazell, D.L. (2005). 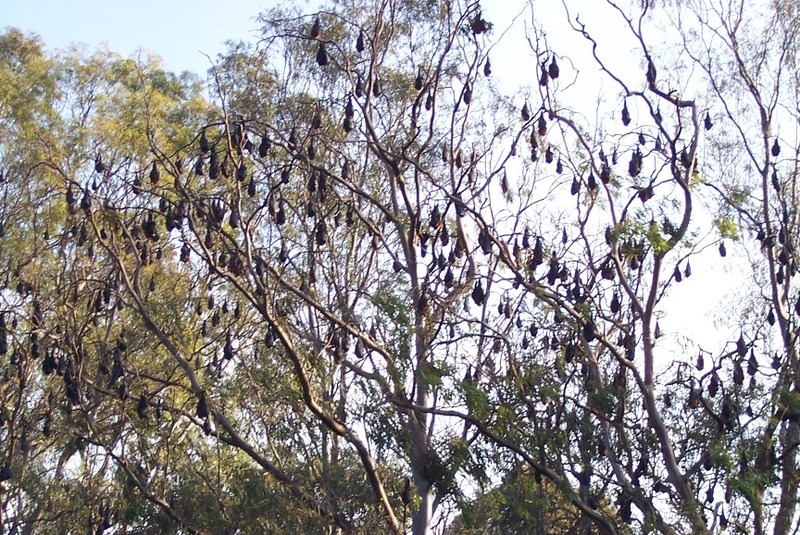 Biotic effects of climate change in urban environments: the case of the grey-headed flying-fox (Pteropus poliocephalus) in Melbourne, Australia. Biological Conservation 124, 267-276.
van der Ree, R., McDonnell, M.J., Temby, I.D., Nelson, J. and Whittingham, E. (2006). The establishment and dynamics of a recently established camp of flying-foxes (Pteropus poliocephalus) outside their geographic range. Journal of Zoology 268, 177-185. Williams, N.S.G. et al. (2006). Range expansion due to urbanization: Increased food resources attract Grey-headed Flying-foxes (Pteropus poliocephalus) to Melbourne. Austral Ecology 31, 190-198.